Here you go! Have fun. Name of the place and city, state is what I looking for. Reminds me of the Baltimore Aquarium! Cheryl You ask so I just answer what it look like on the same note. FYI: I stuck notes on the bottom of the Image so I can keep my self on track. Have fun. Also It tell people when it done, for me. Last edited by GinnyStar; Aug 2 2008 at 10:48 PM. No, It is not on the west coast. Hi everyone. I well check on posts sometime late Sun afternoon or eveing or Mon at the sametime. That depend on the forcast. By the way if you come arcross a buch of z its being stick and I may forget to take it out at myself. [QUOTE=GinnyStar;115742]Cheryl You ask so I just answer what it look like on the same note. In the state of Wisconsin? Ginny, a couple pieces of advice. First, you don't need to tell us when you're going offline. It is expected that people visit the site for short periods one or more times a day, then go offline. Only if you are going to be disappearing for more than 24 hours would you need to let people know about it in this thread. Second, try to answer just the question that is asked, to extend the game more. For example when you answered Jube, you just needed to say that it was not in Seattle instead of volunteering the info that it is not anywhere on the west coast. Third, you do not need to send an answer in PM when a question is asked here in the thread -- just answering here in the thread covers things fine. Here's my question: Is that water in the background behind the building? Edited to Add: Ooooh, I discovered what it is, will sit out now and let others work on it. Is it an Exhibition Centre? You must allow for the differences between UK and US spelling GinnyStar, as well as pronunciation. ("You say neether and I say nyther") This side of the Pond we use an ....re spelling for such words as theatre, centre, metre and so on, rather than an .... er one. Neither is "right" or "wrong", it's a question of usage. As a matter of interest, in UK usage, "metre" and "meter" have two quite different meanings, the first being a measure of length, the second a machine for measuring various things (the amount of electricity consumed, for instance). Is it a state bordering the Great Lakes? Yes, its one of the state bording the Great Lakes. PS I use Quote so I know how answer the question. The Smithsonian Museum of Natural History then in Washington DC. Golly that was back a bit. Hey, Jube, D.C. is not part of a Great Lakes State (Lakes Erie, Heron, Ontario, Superior, Michigan). And it's on the East Coast too. No, you are not crazy I am in a very bad at myself. Sorry not been able to post I was receving but my server could not find MoM it found everything related to Anne's Pern. No. You are getting warmer. I could not get to the MoM site. I had some time and could log on. I geting e-mails, but my server could not find MoM site. Sorry about the dolphin bit, There are no animals, or sports. Its is a where you well find things about music and its history. 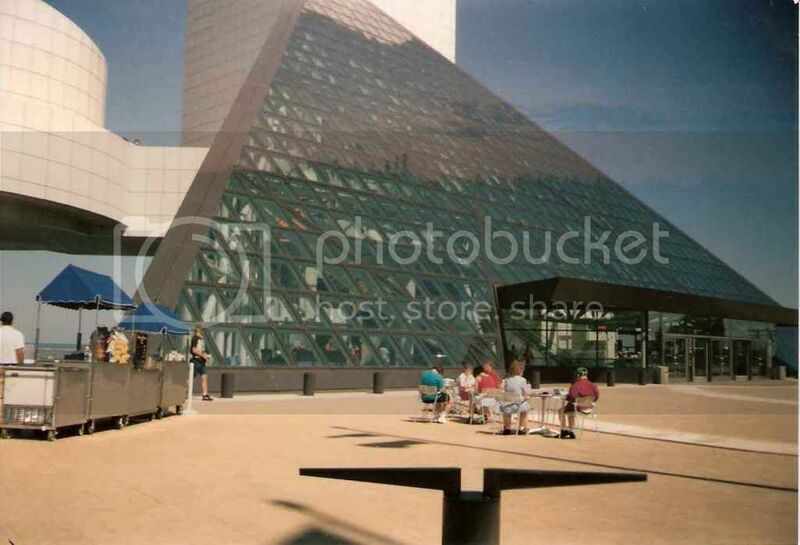 Cleveland's Rock and Rol Hall of Fame. Which is in Ohio. I could not get online to here last night I tried five time and about lost my temper with the system for my e-mail. I could not ever answer anyone quesitons. Hans after feeling like a golf ball hit to every other hole ex. NKT. but this one MoM. I was geting steamed. You were close. Just one state down. Well, on looking again, that section sticking out the side does look like a side view of a guitar. I found a very similar picture, except it was a wider view and didn't include the awning. First time I've gotten one in a while. Hans, to be fair to Ginny, looking up music exhibition centers didn't turn up anything. I started checking each remaining state near the Great Lakes before I found it. Thanks for the suport. There Treas. I could tell member were getting close and I found out I can find the site. I was just trying to tell everyone it was realted to music and histoy. They have a lot to do there, DJ went there on a trip before I meet him. So he is one who took the shot. That why I asked for just the name of it.